[Ingenieros, Delia]. 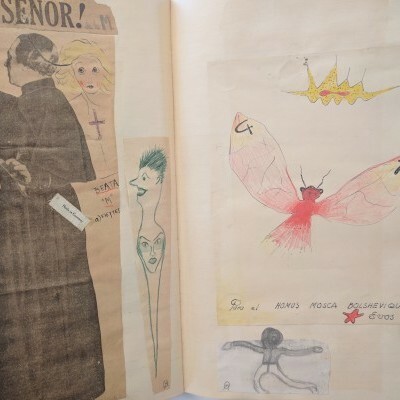 Album Surrealista de Ovarina Merck. [Buenos Aires]: [1938-1941]. 4to, 9-1/4 x 13-3/4 in., 78 pp. 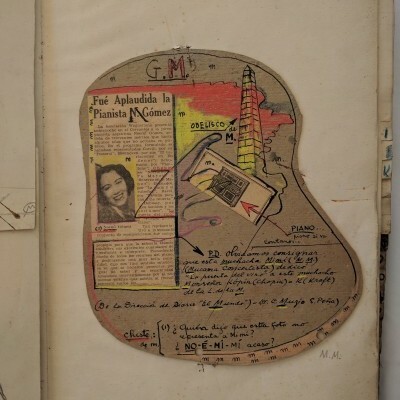 ; commercial alphabetized ledger repurposed as a scrapbook, comprised chiefly of drawings, paintings, collages, and other manuscript materials tipped in, a few items laid in, most attributed to Ingenieros’s alter-ego Ovarina Merck, many dated, the first 21 pp. 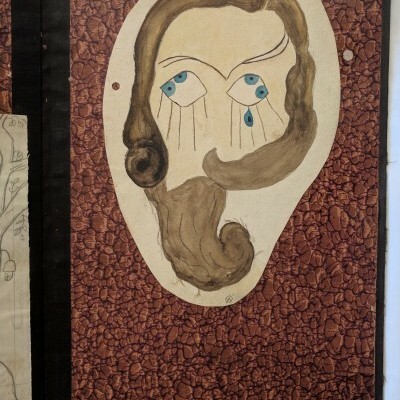 comprised of clippings of images and articles by Surrealists or about Surrealism; cloth with pasted manuscript label, rubbed and bumped. Together with: Kamia, Delia. Memorias de una Maga. Buenos Aires: Ediciones Meridion, 1956 . If this sounds like fiction, it is because Ingenieros lead her life as the protagonist of a modern novel, creating new identities when it suited. 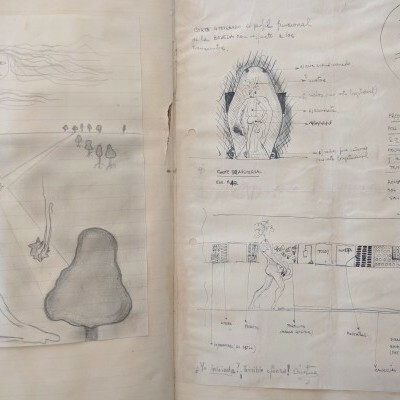 The “surrealist” scrapbook dates from her time in university, a period during which she also began publishing her first scientific papers. 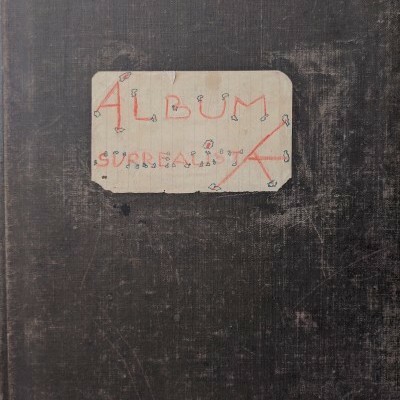 It is a rich visual record of an uninhibited imagination, and although it owes a debt to European surrealism (the first section is devoted to reproductions of work by artists—e.g. 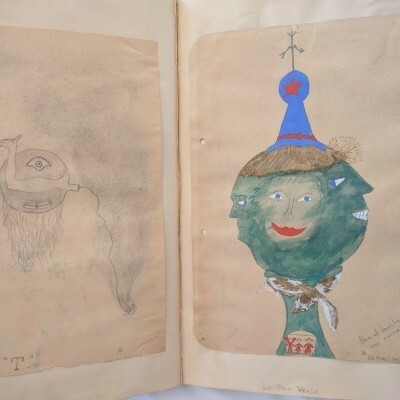 Dali and Victor Brauner—who most inspired her), it is also distinctly Argentinian. 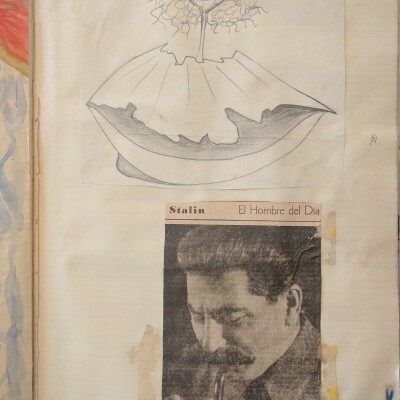 Not content with stock allusions to the unconscious and dream-realities, Ingenieros used the scrapbook to document a parallel reality where absurd and magical events play out in the context of the real world. Nominally, the book is a collaboration between Ingenieros and three friends, referred to here by the aliases M de la M, HM, MMM, and OM. 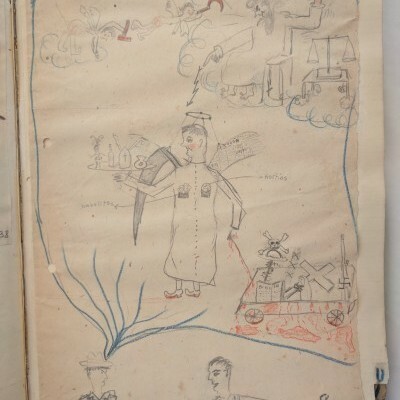 In reality, the vast majority of the artwork has been attributed through manuscript annotations to OM (Ovarina Merck, Ingenieros’s alias), with a smaller number of items by HM (Hombre Mosca). 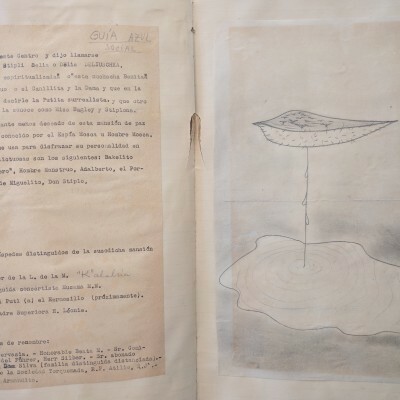 Cross-referencing materials in the scrapbook (including ersatz university degrees; advertisements; and personal letters) allows us to speculate that HM was an alias for the architect Simon Ungar, a member of Grupo Astral, co-editor of the architecture review Tecné, and later responsible for overseeing completion of the only Le Corbusier building in South America, Casa Curutchet. 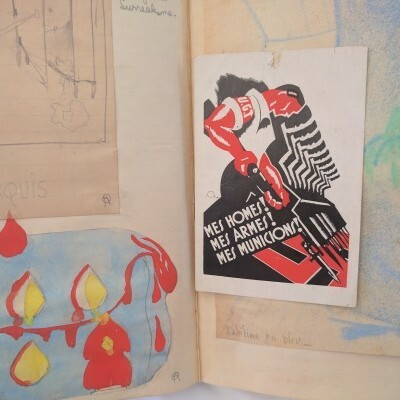 Most of the interplay in the scrapbook takes place between Ingenieros’s and Ungar’s numerous pseudonyms; their artwork and games reference Nazism, Boslehvism, the Spanish Civil War, and the student movement in Argentina, with which she was involved. 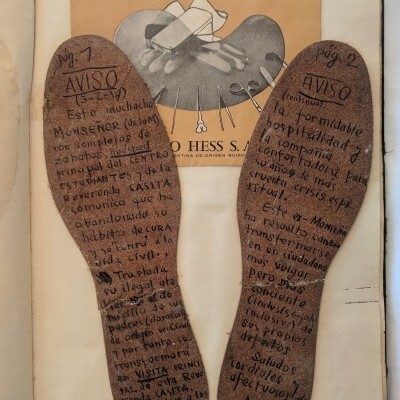 Much of the rest of the content is irreverent, reflecting the deeply nonconformist attitude of contemporary literary and artistic movements in Argentina. 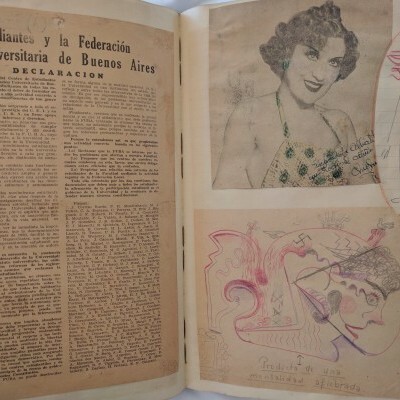 The bold forgeries and complicated fictions of the scrapbook remind readers of Ingenieros’s immediate and personal association to these movements during this period: her younger sister Cecilia was dating Jorge Luis Borges. Although the nature of Borges’s relationship with Cecilia is inexact, biographers and the author agree they dated for a few years, beginning sometime in 1938 and ending around 1943 when she broke it off to travel and study modern dance. In later interviews he claimed he wanted to marry her: he dedicated “The Immortal” to her, and fully credited her with the idea for “Emma Zunz,” one of his only stories featuring a named female protagonist. Borges also described spending time with the Ingenieros family during their courtship; one of his biographers tells how Delia gave him her father’s globe during a visit to their house (it later sat in his office at the National Library). 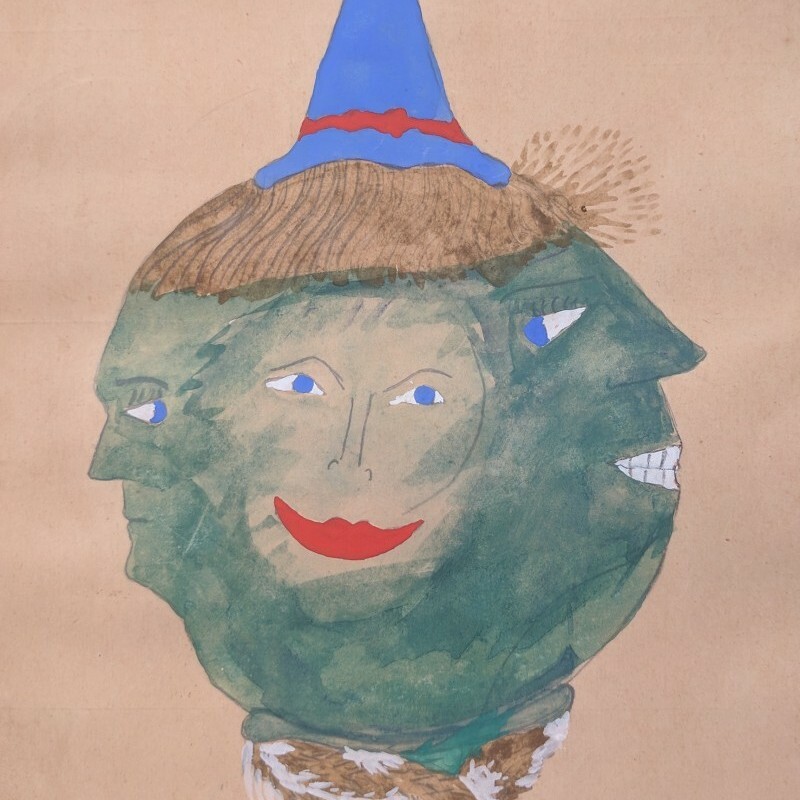 In the intervening years between the scrapbook and Borges project, Delia largely abandoned her work as scientist to become a magician, moving from her alias Delia Kamia to the new nom-de-guerre, Ikama. 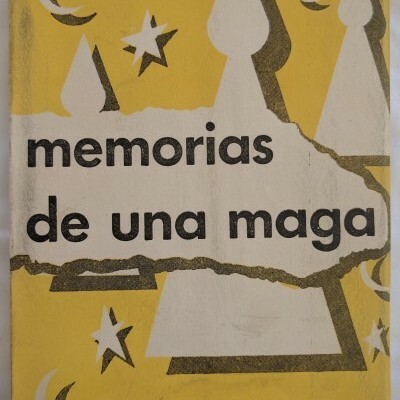 She chronicles this journey in her autobiographical work, Memoirias de una maga (1952). 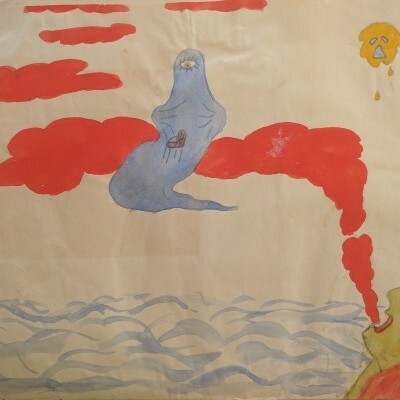 In this account she shifts from the metaphoric or rhetorical use of surrealist symbols to a metaphysical crisis, ultimately rejecting psychology and embracing of the supernatural—or at least the literal possibilities of magic, prestidigitation, and illusion as a way of life. (1) Her father, José Ingenieros (1877-1925), was a socialist and theosophist who wrote for communist and occulist publications. He played a key role in the development of social policy in Argentina and was a leader of the University Reform of 1918, which had a tremendous impact on the relationship between student and labor movements in Latin America. In the last years of his life he left his position as the Chair of Experimental Psychology at the University of Buenos Aires [UAB], founding an anti-imperial magazine and collaborating with Argentinian anarchists.